This summer, you want to enjoy the warm weather while you can. Fall is just around the corner, so it’s time to take in all that summer has to offer, particularly when it comes to spending time outside. 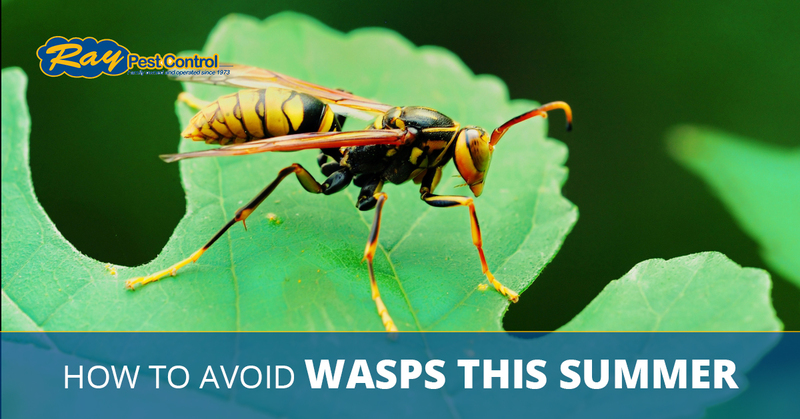 Summer is a time for picnics, backyard BBQs, and time spent soaking up the vitamin D. When you are ready to spend time outdoors, the last thing you want is to deal with wasps. Wasps seem to make a hobby of ruining outdoor activities. When you have wasp infestation, you can’t use your outdoor space the way you want out of fear of stings. Fortunately, there are ways you can avoid wasps, which we have listed below. If none of these tips work, it’s time to call Ray Pest Control in Piedmont. We can help you with any number of summer pests, ensuring that your backyard is the oasis it should be. Therefore, these tips will center around these two ideas. If you have ever been to a BBQ or picnic, you have probably seen wasps hanging out around an open can of soda. Wasps may eat insects, but as their population grows during this time of year, they become more and more attracted to human food as well. You can avoid attracting them to your area by covering up any food or drinks you may have, or keeping them indoors. Whether you are eating tuna, a hamburger, or salami, wasps will be much more interested in your food if it is high in protein. Strange, right? However, if you have ever seen wasps swarming around your grill as you make brats, you know it to be true. You can avoid attracting wasps by keeping the meat and fish inside. Whether you tend to wear florals, herbals, or musks, your fragrance may be attracting the wrong crowd. Wasps love cologne and perfume, so if you are trying to avoid them, skip the spritz when you plan on spending time outdoors. Bright colors may be all the rage for summer, but it is in your best interest to skip the Hawaiian shirt for the next pool party. Bright colors are attractive to insects, particularly wasps. Wasps love bright reds, yellows, and purples, and if you are wearing anything that makes you look like a colorful flower, you are much more likely to attract these pests. If you find a nest, it’s best to call Ray Pest Control for guidance. Removing a nest can be very dangerous, and it is better to leave this task to the professionals. The summer is the hottest time of year, so it might seem illogical to cover up right now. However, when you are trying to avoid wasp stings, covering up is a great way to do so. You have probably seen someone panicking upon seeing an insect, flapping about like they are having a fit. Don’t follow their lead. This only angers wasps. Don’t wave and flap when you encounter a wasp to avoid angering it. You probably don’t feel calm around wasps, but keeping a level head makes it much more likely that you will walk away without a sting. Don’t provoke the wasp; just keep as calm as possible, and walk away. If you have a wasp infestation on your property in Piedmont, call Ray Pest Control. We have the experience and knowledge necessary to address the nest promptly and safely. Contact us today!